The Pennsylvania Transit Expansion Coalition (PA-TEC) has launched a grass roots campaign to restore the R8 Newtown Line between Fox Chase in Philadelphia and Newtown in Bucks County. Rail service was "temporarily suspended" in 1983 and the corridor has deteriorated from neglect ever since. This past June Montgomery County Parks opened the first phase of the Pennypack Trail which runs from Robbins Ave in Rockledge to the RR bridge adjacent to Old Huntingdon Pike in Abington. Phase two will rehabilitate the RR bridge to make it passable for bicycles and bring the trail to Huntington Pike where it will connect to the proposed Lower Moreland Greenway. 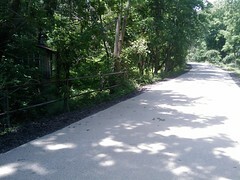 Montgomery County's goal is the connect the trail formally with the Pennypack Bikeway in Philadelphia with the Cross County Trail near Byberry Rd in Bryn Athyn. Bucks County is currently developing a county bicycle plan which should clarify their intentions for this corridor. This conflict between rail and trail has splintered smart transportation advocates across the country and in the transportation scheme of things, has us fighting for the leftover crumbs. As we often argue when trails are pitted against other interests, it is not an issue of us vs them but how we can all coexist. Passenger rail lines and non-motorized trails are complimentary elements of transportation infrastructure that reduces automobile usage. We support the creation of a rail trail along the Newtown Branch to improve bicycle travel, preserve the right of way and to prevent encroachment of adjacent property owners. We believe that there is sufficient right of way available to support both future rail service and maintain trail usage. If there is insufficient right of way within the corridor to do both, then a relocation or rerouting of the trail to preserve the non-motorized route is necessary. We also believe that stations and trains should be designed with bicycle access in mind with sufficient covered bicycle parking and bicycle storage space on new rail cars. If stations and trains are optimized for easy bicycle access. Though lacking in spoecific details, this is the appropriate overall stance. If the train advocates make headway, and I am torn over wether I want them to or not (we need expanded transit service AS WELL AS more recreational trails), a very delicate balance will have to be struck. Part of me wishes to see the line reactivated just to see an existing rail line be brought back into use, and hopefully serve as an argument for further transit expansion, and part of me wonders if this reactivation is the best place to focus efforts, especially with the commitment already in place to build such an important connector trail. With a Right of Way that is fifty feet wide and the restoration of a single track line, there must be a way to have both rail and trail side-by-side. It would be the best of both worlds. We need to reduce traffic, energy waste and GHG emissions. Also the new trains and tracks are so quiet now. We need to be ready for $5.00 to $10.00 per gallon for gasoline that is inevitable.